Each day, more than 6000 children around the world die of hunger-related diseases. Our colleagues from WIKA USA are determined to help reduce that number. 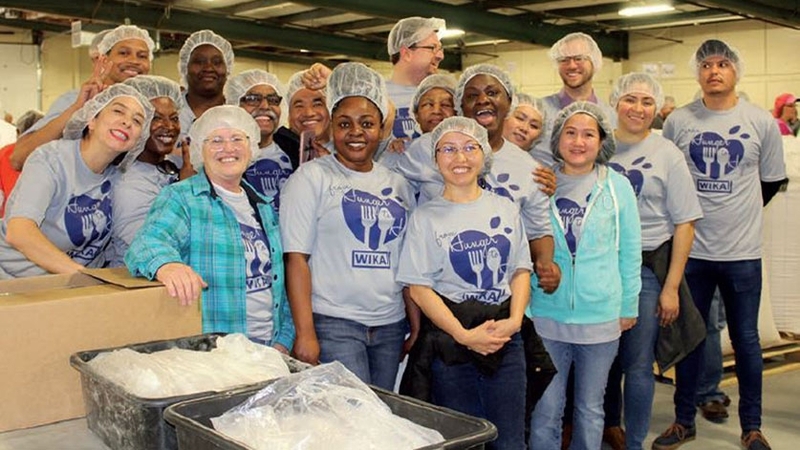 The company’s largest volunteer effort to date in the U.S. was the From Hunger to Hope MobilePack event this March in Lawrenceville, Georgia. WIKA has participated in this event before, but only with 50 employee volunteers. “This time we had more than 100 people who wanted to volunteer”, Jones said. “But as a manufacturing plant, we have on-time delivery goals. With a total of 900 people in Lawrenceville, we decided we could spare about 100. We definitely had no problem filling those spots.” As a leader in measuring instruments and technology, WIKA USA is doubtlessly committed to customer satisfaction, employee education, and continuous improvement. But just as important is the dedication to a company culture of social responsibility, a safe workplace, and a clean environment. To emphasize its spirit of unity and teamwork, WIKA USA has rallied around the slogan “Better Together”.